Obituaries were already being filed for the Wii U soon after its release in 2012, so now that its days have properly been numbered by Nintendo with the Switch’s impending release there’s been little fanfare around its imminent demise. A shame really, for although there were mistakes – a derivative name put it in the Wii’s shadow from the off, and Nintendo’s inability to market the GamePad ensured it lacked a gimmick to make up for the perceived lack of horsepower – it’s been a fine console, allowing Nintendo to refocus on the core and ensuring a string of delightfully esoteric releases. The sales might have been underwhelming, but those who fell into its weird niche tended to be perfectly happy with that they got. Far too few will mourn one of the greatest cult consoles since the Dreamcast, sadly. The other side of Nintendo’s current hardware set-up might well be mourned by many more, though you’d hardly know it’s on its way out. Shelves have been emptied of 3DS units on both sides of the Atlantic – thanks, of course, to the release of Pokémon Sun and Moon, which amounted to Nintendo’s biggest ever launch in the UK – and in the run-up to Christmas and well after it’s impossible to get your hands on a handheld that was first launched well over five years ago. I know from first-hand experience – despite having already owned three 3DSs, I’m always toying with the idea of grabbing another, whether for the delicious face plates and coloured buttons of the vanilla New 3DS or the extra screen estate of the XL. I really can’t get enough of this machine. Such is its success, it’s easy to overlook how strange the 3DS is. First there’s the dual screen set-up, inherited from its immediate predecessor but also cutely calling back to Gunpei Yokoi’s original Game & Watch handhelds. Back at the DS’s announcement in 2004, the set-up felt so unwieldy and, in the original DS model at least, unsightly. It’s only after six years in which the DS established itself as a success that those twin-screens began to feel normal, and not quite so odd. 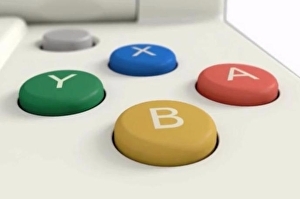 By the time the 3DS was announced in 2010, we’d all got used to the set-up. So Nintendo had to do something else to give it the shock of the new.